For my Sunday outing at the Deerfield (a write-up on Saturday here), I awoke absurdly early, mindful of how I had been shut out at Salmon River tribs when I didn’t get up early enough. I am a very early riser naturally, but some anglers are something else. Gunners. The paranoia was unwarranted. I didn’t see any other anglers. Even the pull outs were devoid of cars. With the river still very high and cold, I targeted soft and shallow water. And, thankfully, it worked. Like the day before, I landed quite a few fish. These were stockies, but I will take what I can get. After enough fish in the net, I started to experiment. I tried different flies, different approaches and different angles. The bite slowed down once the sun hit the water. But, I kept at it. Even though the water was 40 °F, I decided to swing flies and added some serious split shot to tick bottom. It is a lesson learned from my first Salmon River foray: salmonids, even if they’re not hungry, may strike a swinging or rising fly out of instinct. But, you have to get deep. For me, those were the most fun takes. There is nothing like the tug on a downstream fly. And, even better, muscle memory kicked in, and I didn’t pull out the fly when setting the hook; I just pinched the line and slowly raised the rod. I threw streamers and eventually moved to flies that did not naturally swing, such as San Juan worms, just to see what would happen. They didn’t always work but did enough times. It was a hoot. There were some large and fat stockies that showed up. 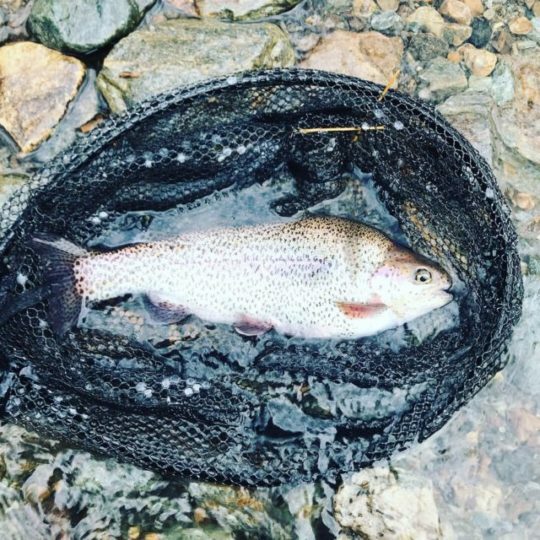 And, one trout was quite the Quasimodo. At 1 pm, things really slowed down. At that point, my back went from just hurting to having muscle spasms. Maybe it was old age. Maybe it was the nine hours of driving over two days and that I had fished hard at the Deerfield, like a man possessed. It felt good and right to reel up and go for this: brisket. I was still in waders and boots when I placed my order, barely controlling the Pavlovian watering-of-the mouth. I don’t think my tongue was hanging out, but you never know, and once you have tasted the fine offerings of A-OK Berkshire Barbeque, you will understand. I’ve had brisket all around the country, and I’m promising you that A-OK has the best I’ve ever tasted. I was standing around outside, enjoying the gentle scent of smoked meat as I waited for my food, when the service window opened, a man smiled and asked me where I had been fishing. He also fly fished and made his own flies. We talked about our favorite rivers, Montana and all things fly fishing. It took a few minutes, but I realized that I was speaking with co-owner Aaron Oster himself. He invited me inside, showed me the smokers and introduced me to his wife, who does the baking (amazingly perfect brioche buns, baguettes and ciabatta). He talked about how the brisket took 14 hours to cook, how he slept in the kitchen and periodically woke up to add wood to the low fire. Aaron clearly was very passionate about fly fishing and his craft. It all reminded me of Hemingway’s Sun Also Rises, when one character talked about how the best bull fighters have aficion, or passion. It’s something you cannot manufacture, and when someone has it, you really not just see it but you feel it, too. 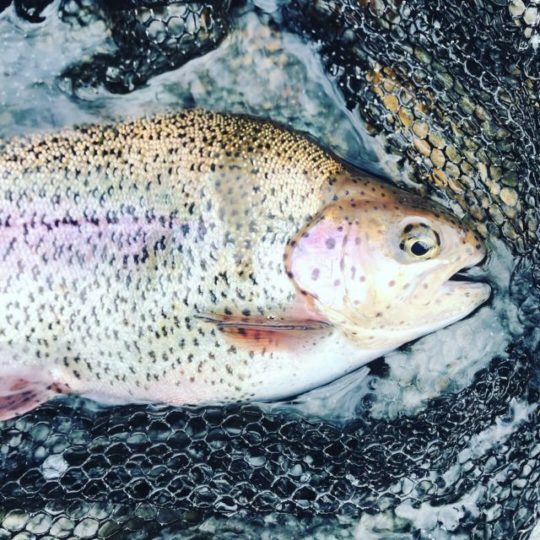 If you’re ever fishing the Deerfield, it’s a very quick drive to A-OK, and that time will be worth it. They’re open Friday to Monday. They sell sausage, brisket, chicken, home-made breads, sides and desserts. In the summer, they offer porchetta sandwiches. Note that there is a brewery across the way, and A-OK will deliver your food there, if you want. Meat and beer after fishing? Sounds like heaven to me. Great to meet you, Aaron! Thanks for the hospitality and the great food! Damn good looking BBQ! Might have to take a ride North! I wear a Thermacare Heat Wrap on my back when out on the river for the day. Really helps with the spasms, keeping the muscles warm and loose. Wow, great suggestion. Thank you! Good story and great looking chow. That rainbow is shaped like a bass. Never caught one that looked like that one. Glad the action on the Deerfield was good. You are a great story teller Jo. When fishing leads to some fun adventures, new friends, and best of all, good food, you are really checking all the boxes! I’ll plan to check out A-OK. Making my mouth water.